Bramha Bhagvan is one of the most unpopular yet important Deities in the Hindu Pantheon. He is fair in complexion, with four hands and usually found sitting on a lotus. He has four heads and four arms. In each of his hands he holds a Veda. Most often the image of Bramha Bhagvan seated on the lotus flower, is growing out of the navel of Vishnu Bhagvan. Bramha Bhagavan is the presiding force of creation. All created beings are his children. Due to his desire to be the most important Deity he told a lie. As result of speaking this Lie, Bramha, originally had five heads, the fifth head was removed and he was cursed never to have his image used in religious service. Due to his role in the universe he was allowed to have his named mentioned minimally in puja. 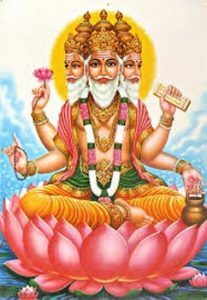 Bramha Bhagvan is also part of the Hindu Holy Trinity along with Vishnu Bhagvan and Shiva Bhagvan.